Great Wicomico River – Chesapeake Chapter U.S.L.H.S. Great Wicomico River Lighthouse was built in 1889 at the entrance to Great Wicomico River in the Chesapeake Bay near Fleeton, Virginia. It was a hexagonal screwpile lighthouse with a fourth order Fresnel lens. 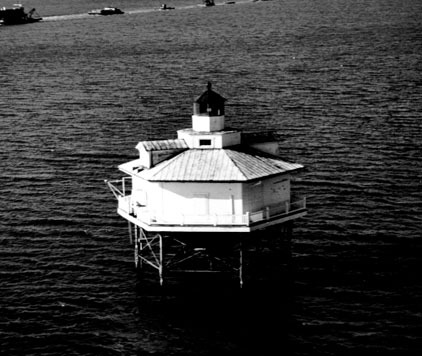 The lighthouse was assembled at Lazaretto Depot in Maryland. The lighthouse was dismantled in 1967 and replaced with a small automatic light on a steel skeletal tower built on the original foundation.